The SolarAssist platform was made possible by the Nova Scotia Department of Energy and Mines and Clean Foundation, with help from Solar Nova Scotia, R&G Strategic and the Halifax Regional Municipality. The SolarAssist platform uses Google Maps to find and display any location you choose with satellite imagery. The platform does not make any assumptions about whether or not this is your home, or location. If you really wanted to, you could search for a random open field and say it has a peaked roof! Google Maps is a maps visualization service provided by Google which incorporates location content of this kind. Our SolarAssist calculator is built with the assumption that your installation will use the standard or average-sized solar panels you might see on a roof in Nova Scotia (these are approximately 1.6 metres by 1 metre, and an average weight of 18 to 22 kilograms or 40 to 50 pounds). These standard, individually-sized solar panels can produce roughly 250 Watts to 300 Watts in optimal sunlight. Our calculations are based on the common annual insolation that Nova Scotia receives. Insolation is the solar radiation that reaches the earth's surface, measured by the amount of solar energy received per square centimetre per minute. A Kilowatt hour (kWh) is a measure of energy, while a kilowatt (kW) is a measure of power (i.e. a thousand Watts). If your solar panels continuously output 1 kW of power for 60 minutes, you will have produced 1 kWh of energy. The amount of electricity you use (or generate) is defined in kWhs. kWp stands for the kilowatt ‘peak’ of a system. The power is calculated under a standardized test for panels across all manufacturers to ensure they’re comparable. 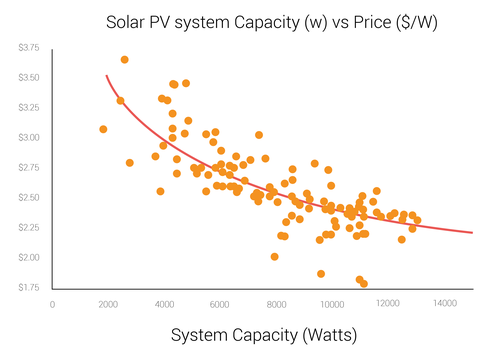 Specific yield (kWh/kWp) is one of the most commonly used performance metrics for solar systems of all sizes. The SolarAssist calculator uses a 1087 average annual kWh/kWp to calculate your monthly savings, based on the average kWh/kWp for our region as recorded in 2017 by Solar Nova Scotia in the Nova Scotia Solar Prices & Productivity Report 2018. To determine your annual expected savings, we first calculate your yearly power consumption based on your average monthly electric bill. Nova Scotia Power’s Domestic Service Tariff for 2018, applicable to electric energy used by any customer in a private residence for the customer's own domestic or household use, including lighting, cooking, heating, or refrigeration purposes, is 15.331 cents/kWh. 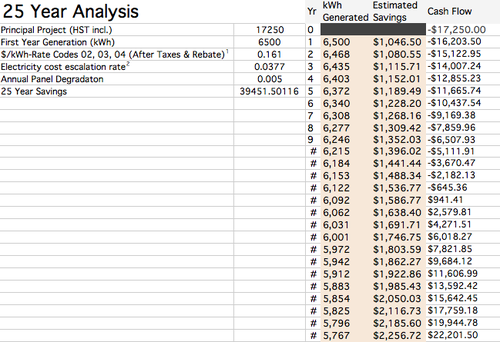 Adding taxes and subtracting the 10% provincial rebate results in 16.089 cents/kWh. This is the rate at which a property owner could save by generating power with their own system. If you have an average monthly bill of $100 (not counting the $10.83 monthly base), you’re consuming 7,458.5 kWh per year. ($100/($0.16089/kWh)*12 months=7,458.5 kWh). We use your yearly consumption rate, as indicated by your average monthly bill size, to calculate your potential monthly savings percentage. The correlation between installation size and the number of square metres of roof or ground space needed to install it is based on an average, standard residential solar panel size of 300 Watts and 60 cell modules. These panels have an average area of 1.65m2 (or 17.76 square feet) per module, which our calculator increases by 10% to leave some space around the edges of the array to avoid high loads from wind shearing at the roof edges. For example, a 6.5 kW system requires 21.67 300-watt modules, or 22 modules. So for every 1kW of your installation, you’ll need an average of 3.4 solar panel modules, and 1.82 square metres (or 19.59 square feet) will be needed for each module. 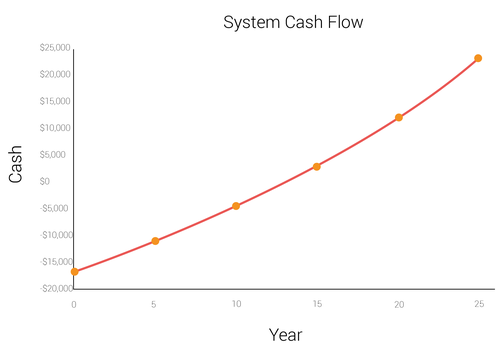 Your time to payback your solar system, as well as the average dollar amount you can expect to save over the course of 25 years, is correlated to your installation size, the 2% expected increase in the cost of electricity, and an average observed 1% degradation of standard residential solar panels over time. Our calculations are based on a 25-year analysis by Halifax Regional Municipality’s Solar City program. We display your net savings (your overall savings minus the cost of your installation, whether you financed it our purchased it outright). The SolarAssist calculator tab uses the HRM's Solar City program as an example, applying a 4.75% interest rate to calculate your potential monthly payments over 10 years, and your adjusted 25-year savings. We encourage you to explore our list of energy financing programs available from participating municipalities and solar providers to find the program and rate to fit your needs. This calculation stacks your financing loan with the SolarHomes rebate, which all Nova Scotian homeowners are eligible for. To calculate the CO2 equivalent from trees we choose the ecologically and commercially vital red spruce, our provincial tree. The SolarAssist team extends its gratitude to Nova Scotia’s Department of Lands and Forestry in helping to profile the carbon stored by a typical red spruce growing in Nova Scotia, which can sequester approximately 9.94 kg of CO2 per year. This calculation is based on the Department of Lands and Forestry’s system of permanent sample plots (PSPs), which are re-measured every five years. The change in carbon stored between PSP measurements is converted to an annual carbon sequestration rate for calculation purposes. Carbon sequestration is then converted to carbon dioxide (CO2) sequestration by multiplying by the ratio of their atomic weights (i.e., 44/12). The total carbon stored in an individual tree is calculated by its diameter at breast height (DBH) using equations from Lambert et al. 2005 and Li et al. 2003. This estimate is based on an average sized tree (i.e., 20 cm DBH) growing in a fully stocked wilderness stand (i.e. a closed canopy) with average soil productivity. To calculate the CO2 equivalent from kilometres driven, we used an average from three of the most popular vehicle models in Canada according to driving.ca (the Honda Civic, the Ford F150 and the Toyota RAV4).